The “Asistencia Santa Gertrudis” (named after Saint Gertrude the Great, a favorite of medieval Iberian Catholics; see here) was an outlying chapel from Mission San Buenaventura. Records indicate it was constructed sometime between 1804-08. In our watershed, along Ventura Ave., is an obscure roadside memorial to this long-disappeared structure. It “served the Indians in the early days,” says the plaque erected by a local historical society. But there is more to the story than that, and I’ve been intrigued to discover it since we moved into the valley in 2005. The chapel site was located near where the El Camino Real branched off up over the mountains toward Santa Barbara (roughly following the path of modern day Casitas Pass Road); it was also situated near a tree sacred to the indigenous Chumash. Yve Chavez, in a 2017 UCLA dissertation entitled “Indigenous Artists, Ingenuity, and Resistance at the California Missions After 1769,” argues that even as the Franciscans were trying to wean the Chumash off their “pagan” ways, the latter were appropriating the former’s spaces to continue their traditional ceremonies (see here, pp. 80-87). But however much this Asistencia may have “served the Indians,” it was also the site of a native labor camp. Here local indigenous “neophytes” were forced by the Spanish to dig clay from nearby Red Mountain, and build a seven mile adobe and stone aqueduct that steered water from the Ventura River to the Mission in the first decades of the 19th century (see more information on the aqueduct go here; pictures here). During the Mexican period (1820-1848) of colonization, the Mission was secularized and went into decline. But around the Asistencia Santa Gertrudis grew a village of refugee Chumash families. Their traditional aps (brush huts; see a picture here) inspired Mexicans to call the site “Casitas.” This name survives today on the local landscape in several places (Casitas town, lake, road)–though its origins would not be known to most people. Indeed, we don’t know much about this little native settlement of the mid-19th century–and the historical plaque tells us nothing. Multiple reports by late 19th/early 20th century settlers attest that Chumash families farmed by the river and sold produce to Ventura, and that there were significant fruit orchards planted around the Asistencia (the padre at the Mission from 1870-97, Fr. Rubio, apparently continued an old tradition of cutting their branches for Palm Sunday services). A diseño (survey map) dating to 1847 for the land claim case of Joaquina Alvarado for Rancho Cañada Larga locates the Asistencia, and testimony in the case indicates that there were Chumash living on the site at that time. A 1932 book on local history claimes that the chapel was used as late as 1868–remarkably, well into the American period–and still occupied at that time by Chumash families. An 1864 proto-anthropological study states that in 1861 “Old Luis, a former Mission alcalde considered Chief of those Mission Indians yet in the area, reported that he had forty subjects at the Cañada in San Buenaventura valley.” But by 1881 settlers reported that the Chapel was in ruins, the site long abandoned; shortly thereafter the remains were plowed under by Salmon Weldon (afte whom Weldon Canyon was named, site of a hard fought campaign to stop a landfill in the early 1990s). The land was put into cultivation (apricots, then citrus, then beans). Almost a century later, the long-lost site of the Asistencia was rediscovered by Cañada Larga ranch foreman Mike Pulido while plowing the beanfield. 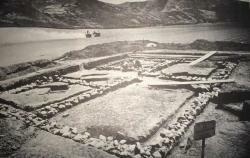 The site then underwent a hurried “emergency archaeological salvage project” excavation in the spring of 1966 (see photo above)–in which the young Carol Pulido took part. Significant indigenous artifacts were found, in and below the Asistencia period layers, testifying to the profound change in Chumash lifeways as a result of Spanish colonization. On January 25th, 1968, the remains of the dig were removed and buried in a pit two hundred yards away, and the site was paved over by the 33 freeway spur. Mike Pulido’s son is my barber, from whom I first heard about this history. His wife Carol is a Chumash cultural officer, who has been helpful in teaching us about the history of this place. She points out that the 1968 destruction of the historic site could never happen today, thanks to slow but steady improvement in cultural remains legislation fought for by native advocates over the last several decades. We have over the last couple of years kind of “adopted” the Asistencia site, researching it’s deeper native history, trying to figure out with Carol and another local Chumash elder how to better commemorate its full story, watering the plants there, and keeping it clean of trash. People occasionally leave mementos at the site, so obviously a few others remember as well. Artist friend Robert Valiente Neighbors did an internship with us in 2016 in which he painted or etched beautiful portraits of both Mike Pulido Sr. and Carol Pulido. He has also just produced several prints depicting the evolution of the site. We will eventually figure out how to turn this material into some sort of fuller tale of the site, to be made available online. A small group of our Farm Church folk commemorated the Feast day of St. Gertrude this last November 15 at the memorial. During last month’s Thomas fire, the flames jumped hwy 33 right at the Asistencia, and the site was torched. Nothing remains but the stone monument plaque and the skeletons of the juniper trees originally planted there. We see this as an opportunity to begin to remake the site and tell the fuller story. This month marks the 50th anniversary of the CalTrans destruction of the Asistencia excavation. So this Sunday we’ll host a small gathering at the memorial, part of our modest but sincere attempts to re-member, in order to discern what restorative justice means in our watershed. Note: Many of the above details about the Asistencia site (as well as the photograph of the excacation) are gleaned from the report of the 1966 excavation: Roberta S. Greenwood and R.O. Browne, “The Chapel of Santa Gertrudis,” Pacific Coasts Archaelogical Society Quarterly (4:4), October 1968, pp 1-60.